Most people think of custom and semi-custom handguns when they hear of the Smith & Wesson Performance Center, but the Performance Center has been putting out some pretty nice rifles as well. One of the newest is the Performance Center M&P10 chambered in 6.5 Creedmoor. The 6.5 Creedmoor is the hot rifle cartridge at the moment, for both hunting and long-range competition. When it comes to hunting rifles, twice as many new rifles are being chambered in 6.5 Creedmoor than any other cartridge. It is, of course, far from the first 6.5 cartridge, but because all the ammo companies are jumping on the bandwagon the number of modern bullets available in 6.5 is just astounding. Whether you’re looking for match projectiles or hunting bullets, most with amazingly high ballistic coefficients, you can find them in 6.5 Creedmoor. The Performance Center M&P10 Creedmoor is a tricked-out version of Smith & Wesson’s M&P10 rifle. The 6.5 Creedmoor cartridge fits and feeds out of magazines meant for the .308 Win., so it is a perfect fit for the M&P10 rifle. This rifle is equipped with a 20-inch, medium-weight carbon steel barrel free-floated inside an aluminum handguard. The barrel has a 1:8 twist and 5R rifling, which many people consider more accurate than traditional rifling. The barrel is threaded, and a thread protector is provided if you don’t feel like sticking another type of muzzle device on the end. 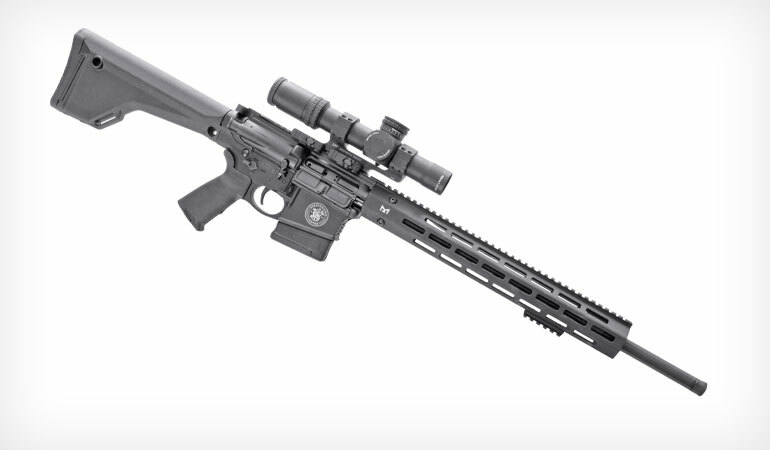 As befits a high-end AR, the Performance Center M&P10 Creedmoor sports ambidextrous controls. While the safety levers are short, Tarr had no problems operating them. 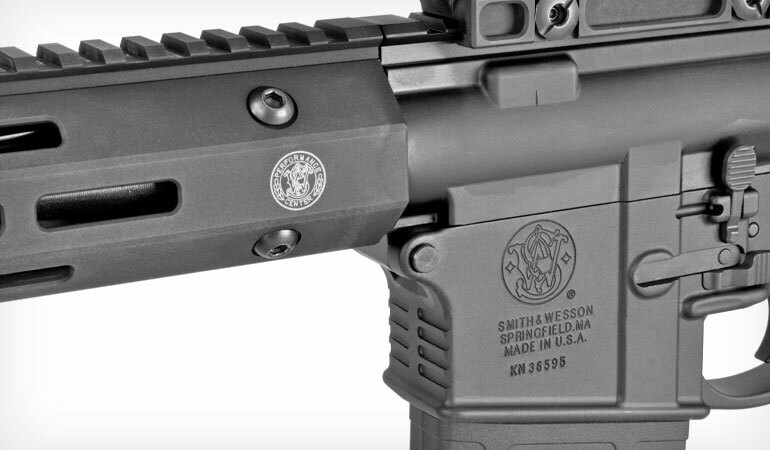 Smith & Wesson’s M&P rifles are standard direct-gas-impingement rifles, with a rifle-length gas system. The 15-inch-long handguard is made by Troy Industries with M-Lok attachment slots all around. A two-inch Picatinny rail slot is provided with the rifle, which works great if you’re looking to attach a bipod. Instead of boring GI furniture, Smith & Wesson equipped it with a fixed Magpul MOE stock and a Magpul MOE+ pistol grip—the “plus” meaning the grip has a rubberized coating over the polymer for increased grippiness. 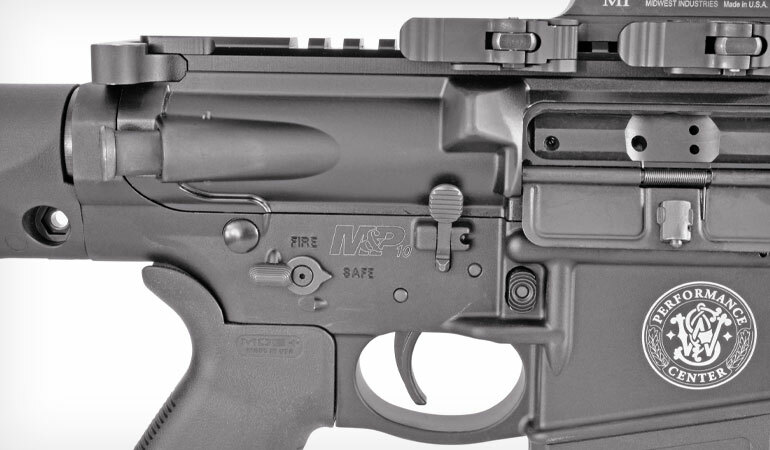 The 15-inch free-float handguard is from Troy Industries and features M-Lok slots. 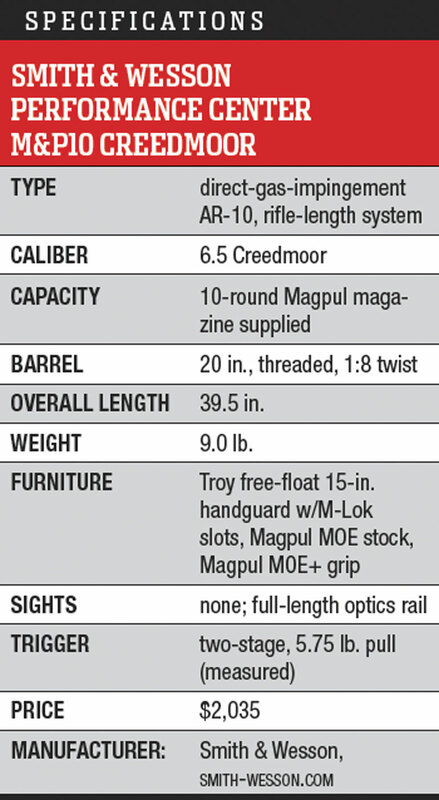 The rifle ships with a 10-round Magpul magazine. For a fire-control group, Smith & Wesson gives you a two-stage match trigger. The measured pull weight of 5.75 pounds on my sample doesn’t sound like much of a “match” trigger pull. However, because it is a two-stage design and the second stage is so crisp, you’ll be able to shoot this rifle more accurately than one with a gritty, creepy standard GI pull. Tarr and Scott Rupp shot the rifle on steel out to 700 yards while filming for “Handguns & Defensive Weapons,” and it did quite well at distance—impressive for a 20-inch barrel. One 10-round Magpul magazine is provided with the rifle, but since it is fed by standard DPMS/Magpul .308-pattern magazines you can buy 20- and even 25-rounders if you’re in the mood for some high-volume trigger pullin’. Total unloaded weight on this rifle is nine pounds, which means once you slap on a scope and mount and maybe a bipod and insert a loaded magazine, the total weight is going to bring pretty darn tame recoil. While I put this rifle through regular accuracy testing at my home range, it really got to stretch its legs during filming of the latest season of “Handguns and Defensive Weapons.” We filmed at the FTW Ranch in Texas, and RifleShooter editor Scott Rupp and I shot this rifle with a SIG Whiskey5 2-10X scope aboard and got hits out to 700 yards. There is always something satisfying in hitting steel at that distance, and the M&P10 was up for the challenge. For accuracy testing at home I mounted a Trijicon AccuPower 1-8X scope, and the rifle was easily capable of sub-m.o.a. groups—even with the less-than-match-grade match trigger. 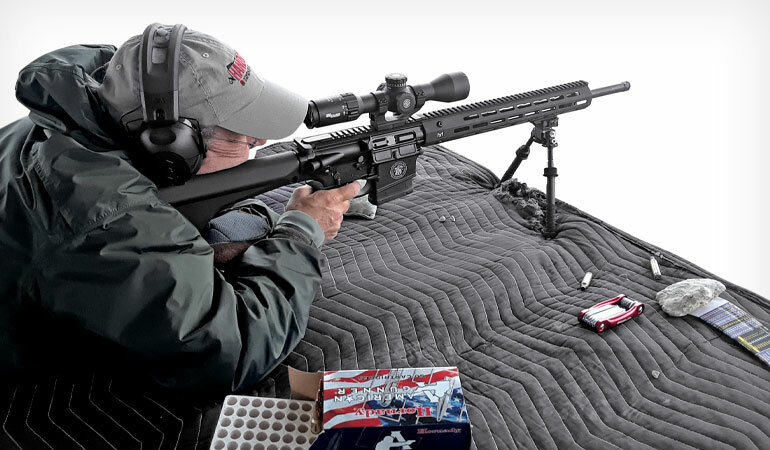 The 6.5 Creedmoor has less recoil than the .308, and it also has a slightly flatter trajectory, but you’re not going to notice the difference until you get out way past 600 yards—and most people who plan on doing that are going to want a barrel longer than 20 inches. Smith & Wesson itself says this rifle is suitable for everything from law enforcement use to hunting, and I can’t say the company is wrong. The M&P10 Performance Center in 6.5 Creedmoor seems to be trying to bridge a gap between the hunting and tactical worlds, and in that goal I think it has succeeded.